While sitting and reading this, you can probably look around and find something dusty. Maybe it is the top of your screen or the top of your keyboard. Dust can be annoying. Dusting is a necessary annoyance. It may be hard to think of it as a critical hazard, though. However, “dust” takes on a whole new meaning when it comes to plant maintenance. If you are one of the 30,000 U.S facilities at risk for combustible dust explosions, dust may be a significant threat to your employees and your operation. If you are curious or want to know more about combustible dust explosions and precautions used to prevent such occurrences click here. Presently, Nilfisk and Nelson-Jameson, Inc. are working together to bring you a line of vacuums to combat this threat. Nilfisk’s line of Explosion-Proof Electric and Pneumatic Vacuums are built to take on combustible dust, helping to improve sanitation and assisting in complying with OSHA standards. You can see these two lines of vacuums and numerous other Nilfisk vacuums and accessories in this catalog. Nelson-Jameson product managers can also assist you in finding the right vacuum and accessories for your facility. Give us a call today at 1-800-826-8302 to order or for more info. 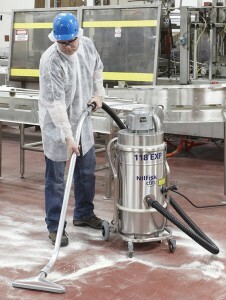 In the food industry and many other industries for that matter, employees work around sharp and abrasive objects. To protect hands from injury, many employees wear cut-resistant gloves – but not all cut-resistant gloves are created equal. This list below shows how resistant a material is to cuts when exposed to a cutting edge under specific loads. ANSI results are provided in terms of grams of weight applied to the specific material being tested. The number represents the weight needed to cut through material with 25mm of blade travel. Notice that cut levels range from 0 to 5, with 5 being the best. 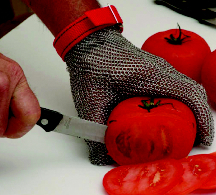 For more information on our cut-resistant gloves, click here. 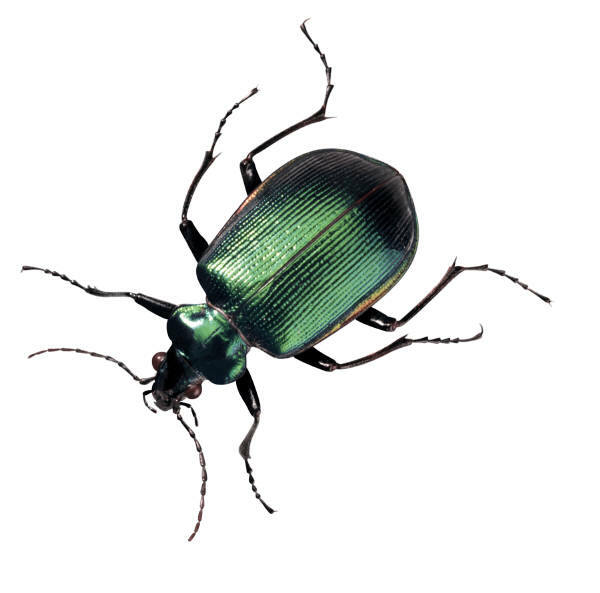 According to the UN, a simple answer for hunger might be flying around our faces, scurrying away from under our feet, and buzzing in our ears: insects. A recent report from the UN stated: “eating insects could help boost nutrition and reduce pollution.” To many, the idea just might be a bit revolting but consider that “over 2 billion people worldwide already supplement their diet with insects” and that some insects are considered delicacies around the world. Dismissed by some, the report brings to light a utilitarian answer to taking on the problem of world hunger. Can Americans stomach it though? Social convention has told us to associate insects with filth and disease, not protein and ecological soundness. Will practicality and accessibility trump social convention? What are your thoughts? Check out a BBC piece chronicling the story here and let us know your thoughts! The safety of the food supply is something we all count on. Food safety issues can be tough to contend with, but can you imagine someone intentionally tampering with the food supply and possibly causing you or your family harm? A focus on food defense in your operation can help reduce the risk of people within or outside of your operation maliciously tainting your product and causing illness or injury to your customers. Where do you start with taking on such an unpleasant possibility like this, though? The FDA, understanding that the concept of “Food Defense” may be a bit overwhelming for food operations, has created the Food Defense Plan Builder. The program is available as a free download on the agency’s website. You can download it here. The download does not require formal registration. Once inside, the program can easily be navigated thanks to clearly labeled tabs that contain information and forms to help assess and build up your food defense plan. From “Company Information” to “Focused Mitigation Strategies,” to getting a comprehensive list of “Emergency Contacts,” users are given access to resources and forms intended to help an operation take a critical look at food defense plans and contingencies. Users are guided through each process in an accessible and practical form that makes taking on such a unthinkable and difficult issue that much more easy. Preventing malicious attacks on the food supply starts with you, your employees, and your operation. 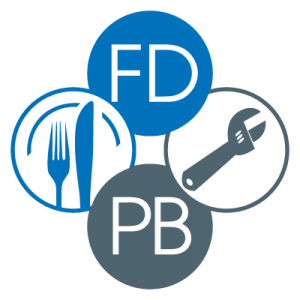 The Food Defense Plan Builder can help raise awareness, engage critical thought concerning the topic, and provide common resources for employees. For questions about the program, operating requirements, etc, click here.